I make no secret of the fact that I am an Apple fan, I enjoy a wide variety of their products and would recommend almost anything in their range to another technology user. However, I have had more Apple Earbuds break on me than I’ve had hot dinners. That last statement may be a grand exaggeration, but it really hammers home my dislike for Apple Earbuds. Picture the scene; you arrive home with your brand new iPod or iPhone. You crack open the beautiful packaging and plug the Earbuds into your new piece of tech. Hitting play on your favourite song in your iTunes Library you prick up your ears for the aural ecstasy you are about to experience. The tinny noise coming from the Earbuds is like a slap to the face. It makes you feel like you have wasted your money. I feel let down by Apple as a consumer when it comes to their Earbuds. I have such a passion and fondness for their products I am overwhelmed with disappointment with the company that is known for bring new innovations to the mass market. Apart from a new inbuilt, clicky remote – the Earbuds haven’t made any advancement since the original iPod. They break extremely easily and tangle worse than any string of christmas lights. It feels like they are coated in some sticky rubber substance that favours knots. 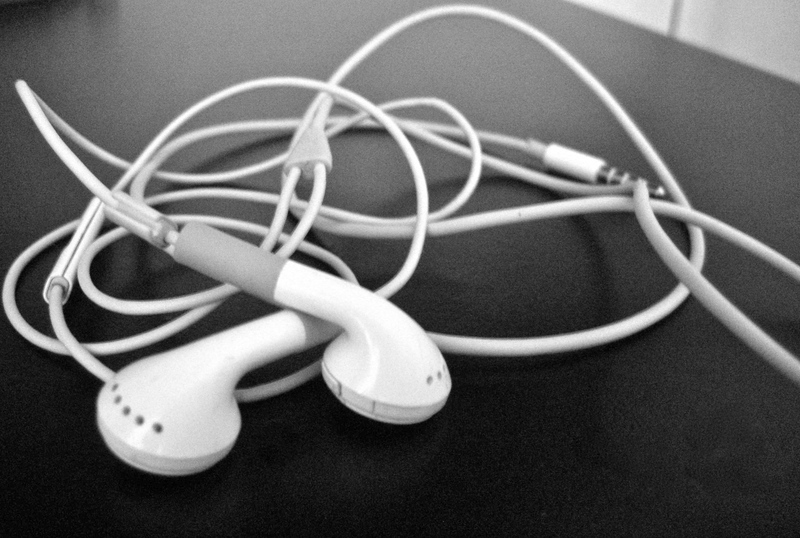 Another problem with the Earbuds is that the average consumer doesn’t realise how rubbish they are. I am no audiophile or expert in the area but moving from Apple Earbuds to some simple Sony over the ear headphones is like night and day. It’s like hearing music for the first time. Steve Jobs may be angry at me, but I can’t recommend enough that everyone invests in a nice pair of headphones or earphones rather than suffer at the hands of the rubbish, and overprices Apple Earbuds. This entry was posted in Music, Technology and tagged Apple, Earbuds, FAIL, Headphones, iPhone, iPod, iTunes, Sony by Jonathan Day. Bookmark the permalink. Force fiction is way too high on that rubber they used to make the cords!